44-year-old Daniel Wu (吳彥祖) was part of the generation that sparked a renewed interest in handsome young idols in the Hong Kong entertainment industry. 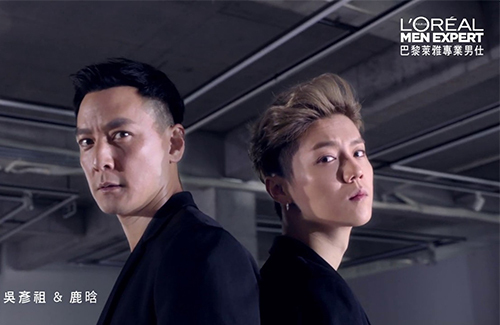 The 20-year veteran has always been a hot favorite for endorsers, and in a new male skincare commercial, he collaborated with popular Chinese idol Lu Han (鹿晗). Both Daniel and Lu Han have a decent international following due to their respective forays in acting and music—Daniel is the lead star of the AMC television series Into the Badlands, and have made supporting appearances in the Hollywood films Warcraft: The Beginning and Tomb Raider. 28-year-old Lu Han was a member of the popular K-Pop group EXO, and is known for having one of the largest young fanbases in China. Looks is a very subjective matter, but when the commercial was first revealed, it came to a shock when most netizens seemed to all collectively agree that Daniel was the more attractive one. Fans were all in awe of Daniel’s handsome appearance—although already 44 years old, he doesn’t look a day over 30. 21 comments to International Fans Find Daniel Wu More Handsome Than Lu Han? Daniel has a more matured look whereas Lu Han still looks like a little boy. I personally prefer Daniel.. we live in the same city in the States and I see him and his family around.. he’s very down to earth. His acting is OK.. not great, not bad.. paired with his looks, I would watch any of his movies. 50 year old Singaporean Chuando Tan are hot. young k-pop fans are the ones enamored with androgynous types like Luhan. @msxie0714 are you trying to list more bad name lol? Chen Kun isn’t bad, however, I would say his good look is enhanced by his on screen charisma. I wouldn’t say wow, when I first see him. Leehom is worse, I like his music enough, and found he’s quite talented in music, but handsome wise? Nope! His face is too long! I possibly have higher beauty standard lol. Lu Han looks terrible and sickly one some of the pic he took with his GF with beard (look like teenager’s beard) on his face. I’m not a fan of Luhan or the look of k-pop singers, thank you. So you think someone like Leehom with the multi-talent, charisma, height, education, intelligence, and good heart isn’t a qualified true beauty just because of his ‘long’ face? I’ll take him anyday over anyone with a perfect face but empty soul. only a very rare percentage have perfect features. imposing such impossibly high standards to be deemed ‘truly’ good looking, those merely attractive people will be judged as not so good-looking and feel pressured to seek surgery. Actually, I truly believe Gillian Chung is air-headed. Look at how she talks! It’s painful listening to her. She is one of the dumbest-sounding person in the industry. And her “twin” sounds just as bad. Lu Han is better looking. “Looks is a very subjective matter”…….for sure. I don’t find either goodlooking but if I had to choose, I’d say Daniel looks better and yes I agree that Lu Han looks like a woman. @passingby Agree. I never find Daniel Wu good looking either. He’s definitely more attractive than the teenage looking kid in comparison and he’s certainly more manly and matured looking. Daniel Wu has more traditional masculine features that has international acceptance than LuHan who looks like a girl that is only popular in Asia. quite interesting how international viewers see aging differently. i thought daniel wu wasn’t aging that well when he hit 28. however, his aging did seem to have ceased after he hit his 30s. so i guess he is still looking young for his age. i think lu han looks cuter, i could seriously have a crush over him if i see him more. daniel wu was seriously hot when he was younger. Daniel Wu looks like a man, the other one looks boyish and/or COULD be a female. I think that’s pretty unanimous.